I never knew what either of those meant when I was a kid. It took a trip to Toledo, Spain, to learn the origin of Aunt Minnie’s favorite exclamation. 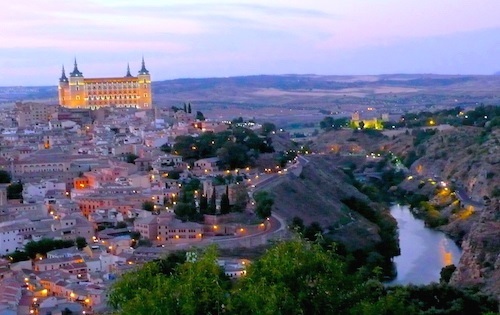 Walking through the winding cobblestone streets, guide Almudena Cencerrado explained the expression of “Holy Toledo.” Suddenly, those words made sense. Even though I grew up in Ohio, I didn’t know about the connection between the Toledo in Ohio and the Toledo in Spain. I also learned that on my Spain visit. “We are sister cities,” Cencerrado said, pointing to a tile sign on a building that pays tribute to Toledo, Ohio. That also explains how the newspaper in Toledo, Ohio, got its name – the Toledo Blade. So, when the newspaper in Toledo, Ohio, was first published on Dec. 19, 1835, it was named The Toledo Blade as a tribute to the heritage of its Spanish sister. Also, at the time the newspaper was founded, the Ohio-Michigan War was being waged for the control of Lucas County, Ohio.